&nbsp Simchat Torah, Hebrew for “rejoicing in the Teaching,” celebrates the completion of the annual reading of the Torah. With joy, members of the congregation read the final words of Deuteronomy and the first words of Genesis and the cycle of learning begins again. We celebrate reading the Torah by involving as many people as possible in this holiday that literally means ‘joy of the Torah’. 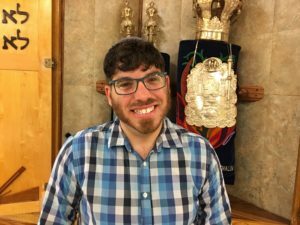 Join Rabbi Bryan as we dance with the Torahs to wonderful, joyous music. Then, we take a “Stroll Through the Torah” and unroll the entire torah around the synagogue and invite our members to read a verse from his or her Bar/Bat Mitzvah Torah portion, whether the Bar or Bat Mitzvah was celebrated one year, ten years or fifty years ago – it is a mitzvah for all to read and hear these verses once again!